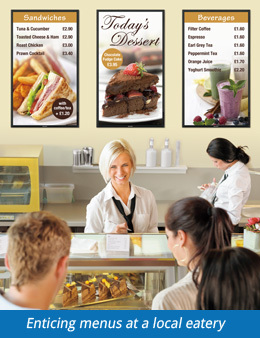 A brightness of 700 cd/m2 (PN-U553/U473) or 500 cd/m2 (PN-U423) supports these LCD monitors in their digital signage duties. And PN-U553/U473/U423 monitors boast 1,920 (H) x 1,080 (V)-pixel full-HD resolution to ensure that none of the detail or visual impact is lost. Thanks to full-HD resolution, everything from fine text to intricate graphics is stunningly crisp and clear. PN-U553/U473/U423 monitors owe their exceptionally thin profiles to edge-lit LED backlighting, where LED elements are located at the edges of the panel. Streamlined for a pleasing appearance and minimal protruding parts, these monitors measure only 57/55/57 mm at their thickest point and weigh only about 25/19/16 kg, making for easy and fiexible placement in offices, public spaces, stores, and other commercial establishments. The stylishly thin profiles also enable attractive wall mounting. Edge-lit LED backlighting on PN-U553/U473/U423 monitors helps ensure reliable performance with low power consumption. 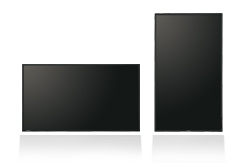 In fact, PN-U553/U473/U423 monitors consume significantly less energy than conventional CCFL-backlight displays. 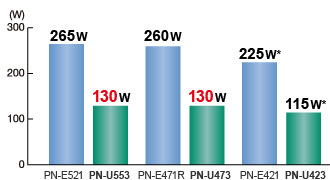 * PN-U423/PN-E421 comparison is based on power consumption for PN-U423 at 500 cd/m2 and PN-E421 at 700 cd/m2. 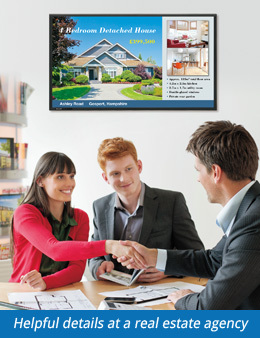 PN-U553/U473/U423 monitors offer a choice of landscape or portrait installation, allowing customers to select the mode that best suits their display content and application. 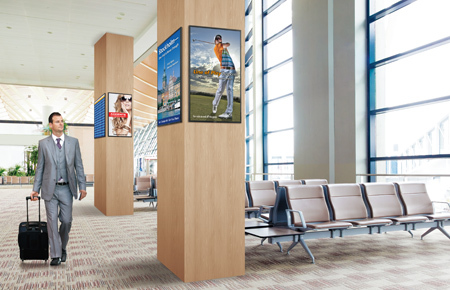 While portrait installation offers the look and impact of a poster, landscape installation puts wide images on vivid display. With Mirror Display mode, the same image can be displayed on a daisy chain of these LCD monitors for the powerful impact of visual repetition. * Via a DVI-D connection. Ideal for conveying audio information and playing location-appropriate background music, PN-U553/U473/U423 monitors feature built-in 10W + 10W rear speakers that eliminate the need for external speakers and ensure a stylishly streamlined profile. A comprehensive range of input/output terminals, including the DisplayPort™ interface, comes as standard on PN-U553/U473/U423 monitors to give customers a variety of connection possibilities. Built solid, PN-U553/U473/U423 monitors are ideal for use in demanding professional applications that require around-the-clock operation seven days a week. The Power on Delay function allows a time delay between the startup of each monitor in multi-monitor installations. This reduces the load placed on the power supply when a number of monitors are turned on at the same time. Should the temperature inside a monitor rise, a built-in sensor will detect it, and the monitor will automatically lower the brightness level of its backlight system. Thanks to an RS-232C interface, PN-U553/U473/U423 monitors* can be easily controlled and monitored from a central location via a PC. Each monitor can be assigned an individual ID code to specify when remotely turning that monitor on or off, changing its input, or making various screen adjustments and settings. * PN-U553/U473/U423 monitors can be connected together in a daisy chain configuration. For total ease of operation, the Schedule function allows up to seven settings to be pre-programmed for automatic monitor turn on/off at precise times on a daily, weekly, or one-time basis.